I haven’t written in a long time. September 6, 2012 was the date I posted my last entry. Doesn’t mean I haven’t been reading constantly and getting excited about the nerdiest/techiest (AKA coolest) stuff out there, just haven’t been putting pen to paper…or fingers to keyboard (at least not in the context of a Word document). In a grand attempt to revive this blog and remind Google that this site is in fact the most relevant search result for the query “laurel marcus” (much harder than it sounds, my name has some serious competition! ), I bring you my first blog post of 2013. I get such a kick out of seeing art that incorporates digital in really creative, out-of-the-box ways. Things like digitizing paintings so that tilting the picture frame causes the objects in the picture to respond as though gravity has an effect on them. Or a camera ball that captures panoramic photos when the ball is thrown. I’ve found that the “digital art” ideas that I respond to most positively somehow interpret a universal feeling/idea/struggle that resonates with anyone at the exact moment of impact. It doesn’t take a genius, or even a real appreciation of art, to understand exactly what the artist is depicting. It is art at its most accessible. 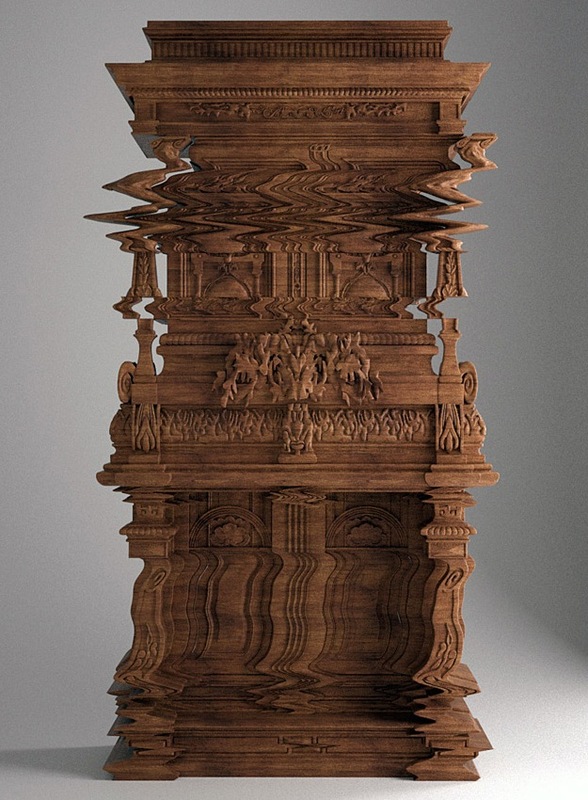 When I first saw a picture of Italian architect Ferruccio Laviani’s “Good Vibrations” wooden cabinet, I instinctively squinted and drew a half-foot closer to my computer screen. Is this for real? Or is my computer broken? How is that…what? 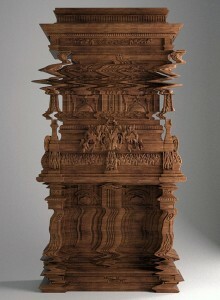 This painstakingly detailed wooden cabinet appears to be in the midst of time traveling from 15th century Europe through Willy Wonka’s TV room and froze mid-journey as the result of a computer glitch. Seeing this picture on your computer screen is like a jolt to the brain. Without skipping a beat, your mind goes to “RED FLAG! BROKEN COMPUTER!” And then you draw closer to the screen and realize good ol’ Ferruccio just played a little prank on you. Imagine seeing this cabinet in real life, where your brain doesn’t even have the excuse of looking at a computer screen to have that automatic “red flag” reaction. With our digitally-adapted brains, we have been so conditioned to react a certain way to stimuli like computer glitches that we have these reactions even when they don’t contextually make sense. If you saw this cabinet in person, your mind for even half a second would likely still go to, “UGH, something is wrong with my computer”… in the absence of a computer. Even seeing this image on a computer, and knowing that the rest of the computer screen is perfectly fine, our minds still jump to that semi-panic mentality. I love how this piece almost mocks our dependency on digital technology. The image of a computer glitch, that everyone who has ever watched TV or played a video game can instantly relate to, is so recognizable that even in the context of a wooden cabinet, even if just for half a second, we still squirm.